I recently visited with a tomato grower who had potato beetles in his tomatoes. The set plants came already infested with the beetle eggs. Once we got-enough energy in the soil and the brix reading high enough in the plants, the potato beetles marched right out of the field. 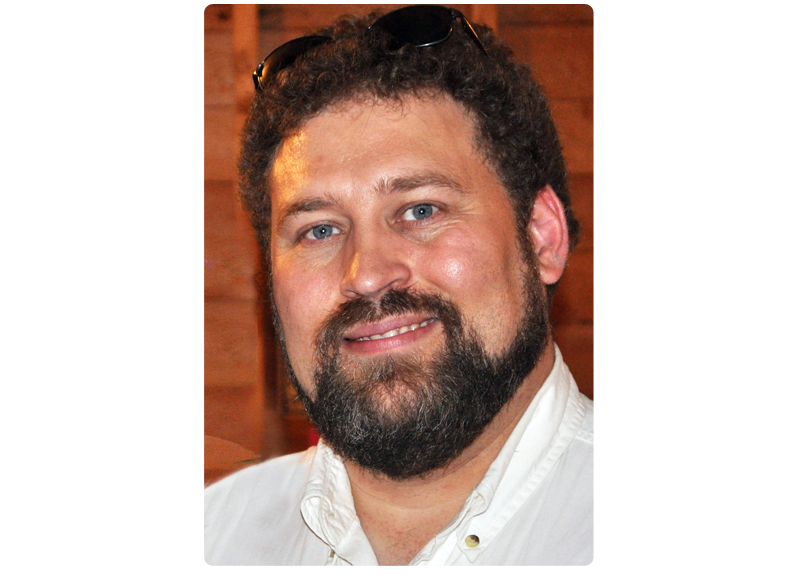 This approach to pest management is completely different from the spray insecticide approach. One of the main things that I emphasize in the winter seminars is monitoring the soil energy to keep the plants strong enough to resist pests and diseases. The test used to measure soil energy is called the Ergs test. This test involves taking equal measures of soil and deionized water, mixing them together and then taking a reading with the probe of a conductivity meter which determines the micromhos per centimeter. Many of my clients are trying to keep these readings above 300 Ergs. Last year many farmers with irrigation let the Ergs fall below 130; as a result, the yields were much lower than they should have been. In fact, this is a major problem for those who irrigate. It is vital to keep the Ergs up so you have strong, sturdy plants. Weak and spindly plants will not support a heavy crop. This is particularly true of tomato plants. A weak, spindly tomato plant cannot support a heavy set of tomatoes. Two elements are very important to get strong, thick, healthy tomato stalks. Calcium and phosphorus are the two key players for strong, healthy plants. Actually, this applies to all crops, not just tomatoes. Available calcium is vital to strong cell walls of plants and the fIrst line of defense against insects, disease and hail. Phosphorus plays a key role in maintaining a high dissolved solids - or brix reading - in plants to help keep insects away. The availability of these two elements is greatly dependent upon soil moisture. Both an excess and a deficiency of moisture can greatly diminish plant uptake of these two nutrients no matter how abundant they may be'" in the"- soil. I prefer the LaMotte soil testing method utilizing the universal extracting solution because it more accurately reflects the availability of calcium and phosphorus. Soil microorganisms and organic acids excreted by the plant rootlets are the key to phosphorus and calcium availability. Soil microorganisms do not function well in either a water-logged soil or an arid soil. I have found that liquid calcium really gives plants a boost in both a high calcium and low calcium soil. High calcium soils are often in arid areas and the calcium is often in such a form that its availability to the plant is very poor. Even irrigated fields can have a calcium availability reduction if overwatered or underwatered. Many people who irrigate do not have a clear understanding of how much water to use, and until that is understood it is very difficult to make healthy plants grow without herbicides and pesticides. The conventional way is to pour on the water, add plenty of nitrogen, and spray, spray, spray until the crop reaches harvest. Each year you do this you need more chemical to keep pests under control and hope you get the crop to harvest before the insects destroy it. This is particularly true of vegetable crops such as tomatoes. Tomatoes are affected by a number of different kinds of insects, all of which can inflict heavy damage if not controlled. Insects like tomato worms, aphids and potato beetles are very happy to feed on your crop. These can best be controlled by keeping your nitrogen applications in check. The number one problem in commercial production insect infestation is the use of too much nitrogen and too little phosphorus and calcium. The quickest way I know to get a good aphid infestation is to put on a lot of commercial nitrogen such as urea, ammonium nitrate, liquid 28% and ammonium sulfate. Early in the season one of the best nitrogen sources I know of is calcium nitrate. This can be applied either liquid or dry. The calcium and nitrate nitrogen in this product are readily available to plants and the calcium will help to build strong, heavy vines that will support a large crop. 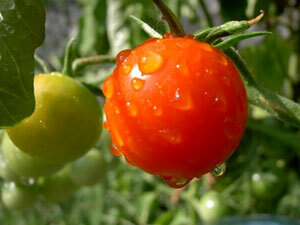 You can control the set of tomatoes by the way you fertilize. Tomatoes demonstrate this more dramatically than any other crop. Once you understand the principles of how to control the set, commercial tomato production can be fun and quite profitable. 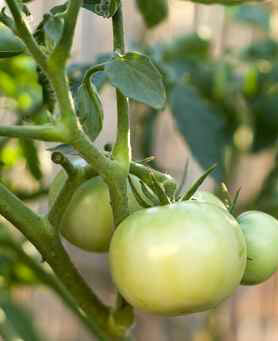 If you plan on raising tomatoes it is best to prepare and plan the fall before you plant. The ground should be worked in the fall by disking, plowing or chisel plowing. A soil test should be performed on the field to determine the pH and mineral ratios. These two products are the backbone of any quality crop. They are best applied in the fall on top of the soil. Plow it in no less than 6 to 12 inches deep. One ton of this mix per acre does well in building a good base for starting a solid soil building program for most vegetable and tree crops. It would work especially well for tomatoes. The purpose of this mix is to build a solid energy base as well as a good nutrient base. I am not sure why this works so well, but I know that it is much easier to get good brix readings and greatly reduce insect problems if you use mixes like this over several years. If you don't have compost, I have found that you can make pretty good progress without it, it just takes longer. Once this mix is well blended into the soil it is much easier to keep the Ergs up in the soil and control soil conditions just the way you want them. In the spring you want to run another soil test from the top 2 to 3 inches to find out what is happening. Spring applications of nutrients are dependent on soil nitrogen levels, Ergs and soluble plant food. For tomatoes, you want plenty of soluble calcium and phosphorus with a little nitrate nitrogen. Calcium nitrate works well for this purpose when something is needed to get good plant growth with strong stems and branches. It also will delay flowering and seed set until you need fruit set. It may take from 1 to 3 gallons of calcium nitrate per acre per week to keep plants in a strong growth phase before switching to the fruiting phase. If the plants show signs of excessive nitrogen, add 1/2 pound epsom salts to the spray mix to release it. It also helps to add 2 quarts of liquid fish plus 2 to 4 ounces of seaweed per acre to help keep insects under control during this treatment. One option is to spread 200 pounds per acre of super phosphate - commonly known as 0-20-0. It is critical that it is true 0-20-0 and not one of many substitutes. Super phosphate is made from naturally mined hard rock phosphate and treated with sulfuric acid. The acid converts the hard rock to a powerful and soluble nutrient energy force that can really give plants a boost. But don't confuse this with soft rock phosphate - generally considered to be a 14 to 18 percent slow release phosphate - which is a natural by-product of a specific phosphate mining process and is collected from settling ponds at the site. The acid treatment of hard rock phosphate converts many of the trace minerals in the hard rock to sulfate form. The result is a highly soluble source of phosphate and trace minerals, including calcium sulfate - a good soil conditioner and energy source. I have had several people use this product this year with excellent results in getting the Ergs to stay above 300-400 when we needed to maintain a high energy level. One of the simpler ways to get tomatoes to set fruit in a backyard garden is to put 2 cups of vinegar and 1 cup of BoPeep ammonia in 5 gallons of water and. sprinkle lightly over the plants and soil. This may need to be repeated two or three times to get a good set and keep the plants fruiting. I have done this for small garden plots as well as commercial-sized fields of tomatoes. If you are a commercial grower and cannot get your tomatoes to set fruit, apply the following mix per acre. Spray this mixture on each acre for two or three weeks and you will have an abundant crop with more tomatoes than you know what to do with. Once you get a good set of tomatoes and the fruit is well established, then you need to return to the growing phase to get good size and good solid tomatoes that are sweet, firm and have good shelf life. 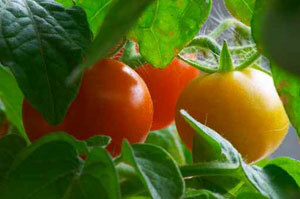 How far you can manipulate these characteristics depends upon the variety of the tomatoes you have planted. Once you have a good set, then you need potassium in the form of potassium nitrate, potassium hydroxide, potassium phosphate or potassium sulfate. The form you use will depend on soil conditions and your soil analysis. You may also need more calcium to get good size. If you need size and higher brix readings to control insects, use potassium phosphate in your foliar sprays. You will find that raising tomatoes without chemicals is possible if you follow these principles, but it takes careful planning and frequent crop monitoring to keep on top of things. Once the soil gets in good ratio, it really becomes quite easy. Until then you face many challenges. The bottom line is that if you are having disease and insects in your tomatoes, something is out of balance. The first things to check are your calcium and phosphate levels. For quick fixes, liquid calcium nitrate and liquid phosphoric acid can prove to be valuable aids. I find that the first two or three years are the most difficult to manage, because these ideas are new for many of you. It takes a little getting used to for some not to resort to spraying pesticides instead of spraying nutrients when problems occur. Spraying herbicides and pesticides over a crop often makes the ergs readings in the soil drop dramatically. If this happens, the plants become even more susceptible to insects and disease. There may be times when using an insecticide is necessary, but quite often you can do without if you follow the rules. In the beginning, keep some liquid fish and seaweed powder on hand to supplement your spray mixes and keep insects under control. Generally, the ratio of seaweed powder to liquid fish that is most effective is as follows. Be sure to mix the seaweed powder with water first and let it sit over night before adding the liquid fish. Keep the ratio of seaweed to fish in proportion and you can add it to most any liquid NPK spray program with excellent results. It works very well through pivot irrigation systems either by itself or mixed with other spray programs. By maintaining high brix readings and watching the calcium, phosphorus, and nitrogen levels, common diseases such as blossom end rot, early and late blight and anthracnose will not be a serious problem. Using these techniques, I have witnessed tomatoes layered in rows 1 foot to 1-1/2 feet deep and all ripen without the bottom ones spoiling. Nitrogen control in tomatoes is critical because excess can be just as dangerous to the crop as not enough, and both situations can bring on insect and disease problems. Remember to add a little epsom salts too release excess nitrogen if needed, and use liquid 28%, ammonium sulfate, ammonium nitrate or urea if you need to raise the nitrogen levels. Whether you are growing garden tomatoes or commercial tomatoes, once you learn how to properly use these products in a fertility program, you will find that you can grow tomato vines when you wish and set tomatoes of superior quality when you wish.